Canadian based film company Whistle Stop Productions selected Eric Pfeifer to do 3 local REAL ESTATE televison shows to be aired on the DIY Network to their audience of 58 million viewers. From December 7th - 14th cameras were rolling all over Sanibel from the beach to the bay to the canals and many more locations as the shows Canadian based film crew directed three episodes. Two episodes were filmed with Eric Pfeifer on Sanibel Island while the last episode features Bonita Beach properties with Heather Pierce, Broker Associate at Pfeifer Realty Group. 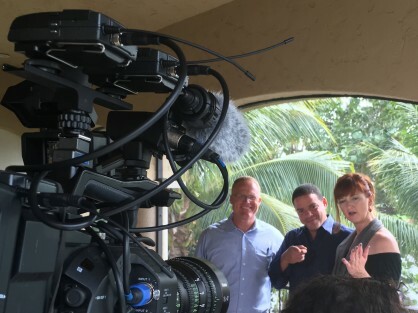 The first show filmed on Sanibel focused on homes with canal Views and the second show explores homes for sale with private beach and bay views. The Bonita Beach episode looks at properties with "birds eye" beach views. What's for sale with a view will air in September in Canada, Europe, China as well as the United States on the Do It Yourself Network. The DIY Network will air the series to an audience in excess of 58 million viewers and Destination America Discovery will also air the series. The photo above shows buyers Pyro and Kelly discussing the three Sanibel Canal View properties they have selected as their favorites. The photo below shows buyers being filmed on Woodring Point, Sanibel as the compare and contrast three homes all with private waterfront beaches and palm tree views. Anytime a reality TV show is produced, a casting tape is required. Producers knew they wanted to feature Eric in one episode of "What's for Sale With a View" but the casting tape was a must. Their only limitations were that the tape must be 2 minutes long, entertaining, show your personality, highlight the show's theme, and most importantly not be filmed professionally but with a phone. Below is the video Eric submitted. It was so well received, that Whistle Stop Productions cancelled two episodes they were planning to film in Miami, and asked Eric to do three episodes for Season 2. My Movie from Eric Pfeifer on Vimeo.